Ralph F. Kelly of Emmitsburg, Md., was a battle-hardened veteran of World War II by the age of 24. It only prepared him for what was to come. “He was with the first Allied troops which invaded the North African coast last November, and has been fighting steadily since with the exception of a two-week period spent in a hospital recovering from wounds received in initial engagements,” the Gettysburg Times reported in 1943. In August of 1943, the Allied Forced invaded Sicily. The soldiers met strong resistance from the Italian and German armies as each side battled to control the high ground in the hilly country. During the fighting, Sgt. 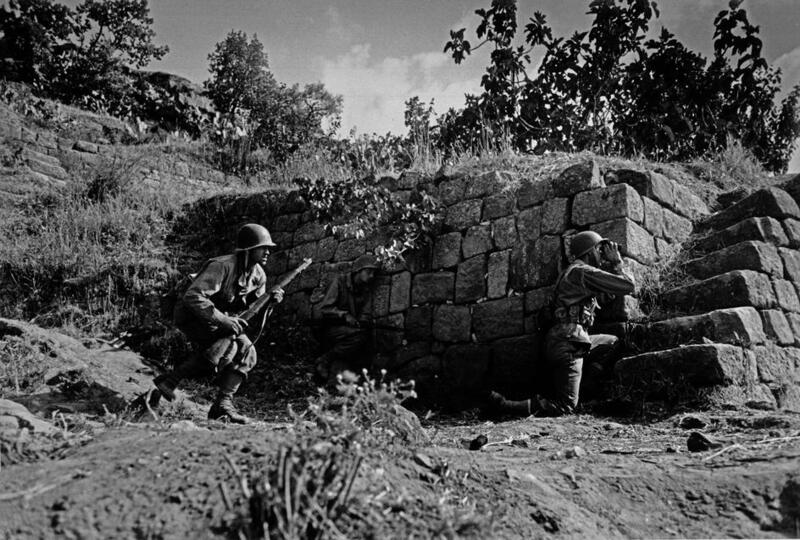 Kelly found himself behind a machine gun firing on the enemy. He fired on the enemy time and again, but eventually, he and the other riflemen in his machine gun nest found themselves isolated from the rest of their company as the Axis soldiers slowly pushed forward. The enemy fire began focusing on the machine gun nest as it was one a diminishing number of close Allied targets. “Although the machine gun was isolated from the rest of his company and bearing the brunt of an enemy counterattack, Sergeant Kelly refused to leave his position despite the ferocity of the enemy attack and the fact that his ammunition was seriously depleted, Sergeant Kelly continued firing upon the enemy and inflicted serious casualties,” Kelly’s Silver Star citation read. For Kelly, it must have seemed like just another workday. Kelly graduated from Emmitsburg High School in 1935 and took a job in the Taneytown plant of the Blue Ridge Rubber Company. Kelly was inducted into the army in January 1942, following in the footsteps of his older brother, Luther, who was a veteran of WWI. Kelly trained for six months at Camp Blanding in Florida and Fort Benning in Georgia before being sent overseas to become part of the First Army of the First Division. He landed in North Africa with the Allied forces in November 1942 and was hit with shrapnel in his right leg. He spent a few weeks in the hospital and returned to duty with a Purple Heart. During a fight near Gela, Sicily, Kelly saw a wounded soldier lying in the open and in danger of being shot and killed. Kelly rushed from his place of safety to grab the soldier and carry him to safety. This action earned him an Oak Leaf Cluster for his gallantry. He was wounded again in November 1944 while fighting in Germany and had to spend a couple more weeks in the hospital. During his time overseas, Kelly saw fighting in Africa, France, Sicily, Belgium and Germany. Kelly was given a month’s leave in early 1945. When he returned home to Emmitsburg to visit his family, the Gettysburg Times dubbed him “Commando” Kelly. “Although his honors do not include the Congressional Medal – highest award of any of the armed forces – Sergeant Kelly’s decorations include enough other ribbons to weight down his tunic,” the Gettysburg Times reported. “Commando” Kelly died in 2003 at Taneytown, Md.